M. Jules Oppert (b.1825) was a famous linguist and translator , dealing with Mesopotamian cultures. He is known for his work deciphering Sumerian Cuneiform clay tablets, some of the earliest known writing. These messages were achieved with a stylus in damp clay, then hardened. 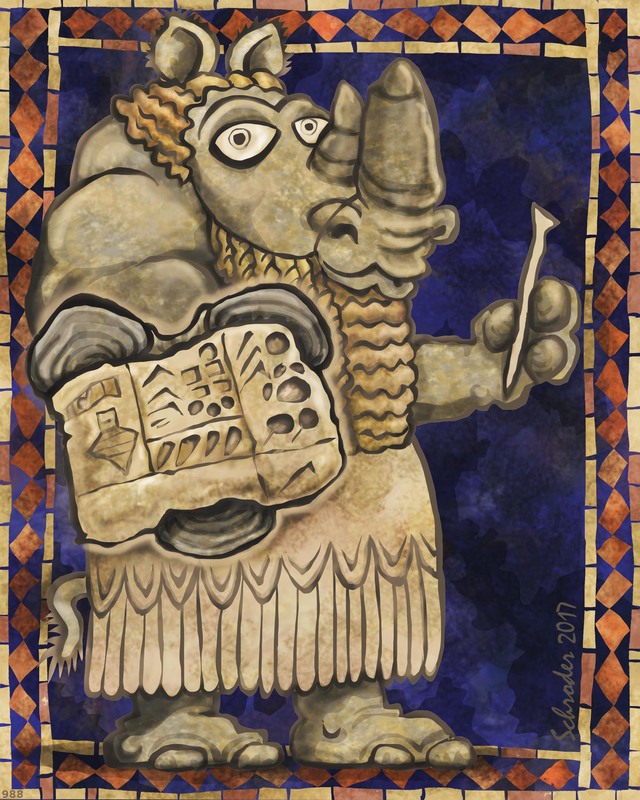 In case your Cuneiform has gotten rusty, the sample shown says, roughly, “Rhinos are mighty fine critters”. Thank you for your good work, M. Oppert. Thank you for the Cuneiform lessons. Did you go all the way to Assyria for your research, or just stop off at the British Museum? I’m guessing the ancient Assyrians would find my handwriting as curious as we do theirs. Viva la difference! Yes, my cuneiform is a little rusty, but I agree completely with your translation. Good work. Thanks. RhinoTranslation is one of YIR’s Specialties!